I was born in León, in the north-west of Spain, but regard myself as a citizen of the world. I graduated in Economics at the University of León and obtained my MBA from the IE Business School. I have devoted myself professionally to the area of people management as I am wholly convinced that people are the key to competitive advantage. I have pursued my professional career in Madrid and, currently, in Barcelona, as Senior HR Business Partner at Sanofi Iberia. In the past 20 years or so, I have been fortunate to work in a wide range of different business sectors and cultures: Consulting (Buck Consultants – www.buckconsultants.com), Online Banking (Uno-e – www.uno-e.com), Telecommunications (Broadnet) and Pharmaceuticals (Sanofi – www.sanofi.com) in areas of national and international responsibility. I have been involved in start-ups, mergers, growth phases and profound change and restructuring processes. In addition to specific economic or business cycles, I have sought to help create competitive companies, based on high performance and sustained reputation, with a special emphasis on prioritising people within organizational frameworks. I greatly enjoy researching and teaching business transformation and innovation and people management. As a lecturer, I have collaborated with some of the leading Business Schools in Spain (IESE, ESADE, EADA and IE) and Business Associations (AEDIPE and AED). 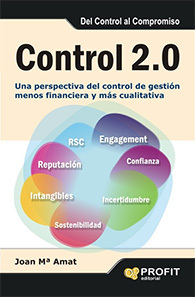 I am the co-author, together with Joan Amat, of the book entitled “Control 2.0” (http://ow.ly/rZrzt), which reflects on management control, intangible assets and long-term organizational success. I hope you enjoy my blog which includes a selection of articles, both by myself and other specialists, which I consider to be of interest. I encourage you to share your views on my blog entries and to register as users.